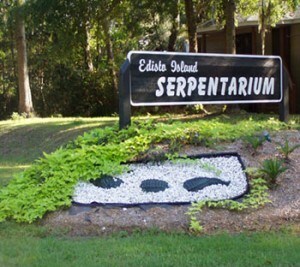 Driving into Edisto Beach you can’t help but notice the Edisto Island Serpentarium. Even if you resist the temptation to stop after the longest of road trips, you will want to come back for a visit. Edisto natives Ted and Heyward Clamp display a variety of reptiles from more than 50 years of snake hunting experience. The Edisto Island Serpentarium is a combination of modern indoor facility surrounded by beautiful outdoor gardens. unlimited amount of information on reptiles can also be found indoors, along with some of the most knowledgeable experts ready to guide. Moving to the outdoor gardens you will find an impressive display of nature. Unlike most facilities onlookers will not find a lot of glass. Instead, peak over low-walled enclosures to view snakes and other reptiles living in their natural environment. Trees, limbs, tree stumps, streams and more create an environment purposely designed to offer visitors a truly natural experience of nature. The Edisto Island Serpentarium houses an impressive 19 adult alligators. Also find box turtles, red-eared sliders, diamondback terrapins, soft-shelled turtles and common snapping turtles. Non-venomous snakes on display include rat snakes, black racers, coachwhips and water snakes among others. Cottonmouth moccasins, copperheads and rattlesnakes are included in the venomous habitat display. Iguanas, which are non venomous, are also on display and are fun to watch climb and swim. Ticket prices can be found here, with special rates for AAA members and other group rates.